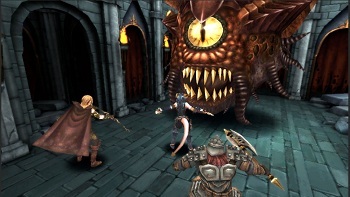 Many dungeons and more than a few dragons are coming to Android and iOS soon. Dungeons and Dragons isn't just a cultural shibboleth for nerds, it's the stuff we use to tell our modern myths. It takes a collection of traditional European mythology (largely filtered though Tolkien), and renders it into pieces that players can use as storytelling lego bricks. Those special elements might not translate well into things like movies and mobile games, but that doesn't mean it's not a valuable license! To wit, D&D is getting its first officially-licensed mobile title. Called Dungeons and Dragons: Arena of War, it's bringing dungeons and likely a few dragons to Android and iOS. All the expected elements will make an appearance: a party of racially diverse adventurers, various subterranean passages, and nasty monsters who must who must be murdered and robbed. It will take place in the Forgotten Realms setting, the 4ed version if the tiefling rogue in the screenshot is any indication. As per mobile tradition, it will also be free to play. Anything else remains a mystery that not even a stellar bardic knowledge check will uncover. We do know that it's being developed by mobile mogul DeNA, the same company that Peter Molyneux's working with for his new GODUS game. While only just announced, interested players can go ahead and sign up right now and earn an "Ultra Rare Power" when it launches. I'm hoping that means that your character can blow a smoke-filled bubble out of his ear.